Gabrielle's photo caught my eye in Facebook cargo bike group. She has two sets of twins. That's right- TWO SETS. As a twin mama myself, I bow down to her for this fact alone. But it turns out there is even more to Gabrielle's story and I honored that she decided to share some of that here... and a little bit about her lovely e-assist cargo trike, too. 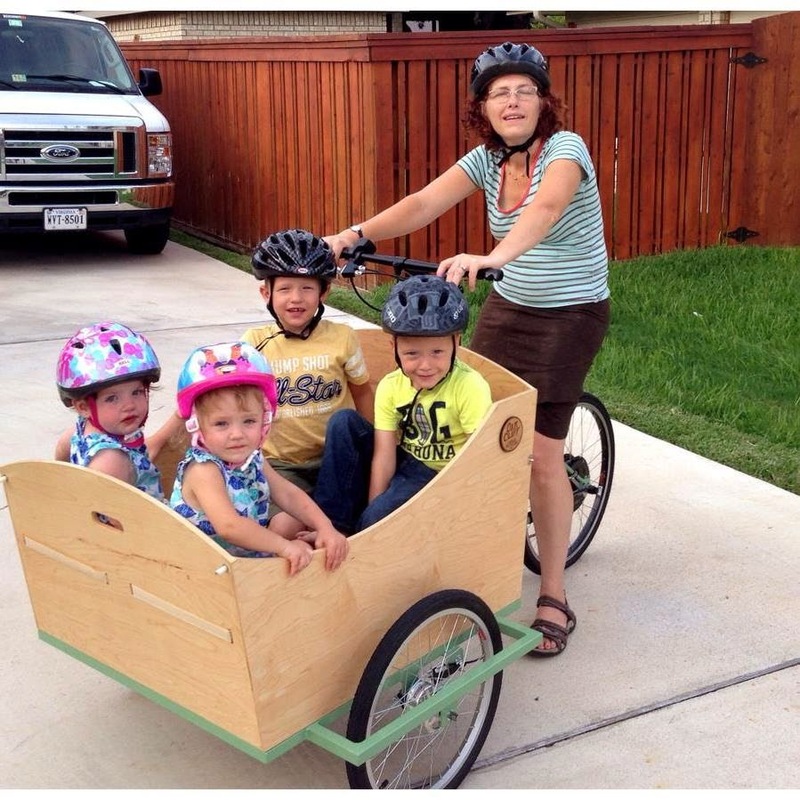 I’m Gabrielle, the mother of five kids (including two sets of twins) and I’m new to cargo biking. We own a bakfiets style trike made by Oak Cliff bikes in Dallas, TX. I can’t remember where I saw the bakfiets style bike in use, probably in the Netherlands. I always thought they were awesome. Then one day stumbling around the internet while searching something like “dutch bike for many kids”, I learned about Emily Finch. Then I read Sara’s blog and watched “Less Car More Go” about 90 times. But since I live in Central TX, the conversations went like this, “a bak-what?” This is an area where the car is king. I spent many hours after learning about cargo bikes that there are none to be found in Central TX. I searched Craiglist and checked out bikes shops in Portland and on the East Coast with no luck. Finally someone told me about Oak Cliff Cargo bikes in Dallas. The rest as they say is history. My husband thought I had lost my mind. My goal was to bike our kiddos three blocks to the local elementary school (by myself) and return. I’m from PA, and grew up in a college town with dedicated bike lanes and I desperately wanted biking to be part of my life. I was used to walking or riding every place I wanted to go. I want my children to know that they can physically go places by themselves at their own pace. We retire this spring and are moving back east. The Army will move my bike (at no cost to me)! Win all around. The only problem was my husband had concerns about my ability to ride a bike. You see, in 2006, I fell out of a helicopter in Iraq. Luckily for me it was not a combat injury, just an accident in a combat zone on the last day of my deployment (because it couldn’t be the first day naturally). Long story short, I now have a spinal stimulator in my spine. I had to give up my last bike, a nice folding Dahon because it was too much for my back. How was I going to pedal four kids in a heavy wooden box? Enter Jonathan, the owner at Oak Cliff, who added an electric assist to the bike. It makes all the difference in the world for me as the electric help takes all the pressure off the base of my spine. It has given me many new opportunities to interact with nature, my children, and my community. Biking allows you to interact with people and the world around you. It draws people to you in a way that cars can’t. On a bike, I am approachable (once you get past the four squalling children). One time a woman pushing newborn twins in a stroller chased me down two blocks to ask about it. People love my bike and they tolerate me schlepping four kids in it. Interestingly, we have a contingent of Dutch soldiers here at Fort Hood (Air Cavalry, I believe). They often bike their kids to school. The love the bike and offer tips. They even can pronounce “bakfiets." I’ve had some wobbles with it (I learned that the sidewalk with the benches are too narrow to navigate and I should stick to the car drop off lane). Fathers have pulled me out of the mud. Women congratulate me. People wave and smile. My children will meet people who embrace our nontraditional transportation. We learn about the weather and we learn about each other (my girls HATE their helmets). It is a source of much joy. The kids love to ride in the bike and I love that I can master it and it truly allows us to embrace life on a different level. I am Gabrielle, a combat veteran, a clinical social worker, a mother of multiple multiples and a devoted cargo biker. Thank you Sara for the inspiration. Biking has changed my life and magnified our joy.